Two teenage girls were arrested Friday night at South Valley Community Church, and neighbors say they’re tired of the drinking, kissing, cussing and smoking teens attending the church’s outreach concert series. But pastors at the church believe the two teens are not reflective of all the concert goers attending the shows and hope to find a way to keep the peace in the neighborhood. Neighbors say that rowdy concert goers repeatedly engage in alcohol and drug use, screaming during the late night hours, and fondling each other outside the church during the concert sessions. Is it good that sinners come to church or not? I’m gonna go with yes. I’m also gonna go with, you better be ready to suffer the consequences of it! I believe Jesus was killed for something similar. It is my pleasure to announce that the ebook I’ve been working on for six months or so is done! As you can see by the picture, it is called Deer Pants for the Water. Thanks to Forrest Kaiser for his work in this illustration. 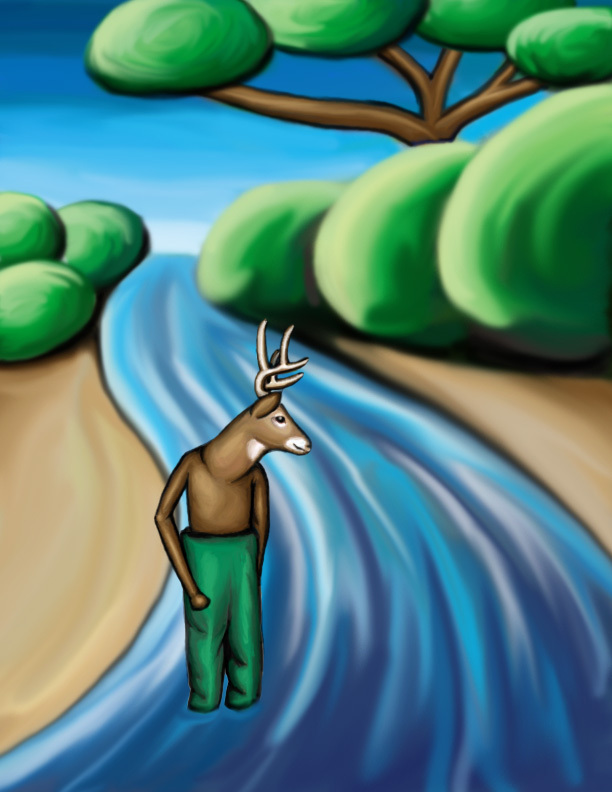 Deer Pants for the Water: Things You May Have Missed in the Bible, is about all the things we’ve heard so many times, all the subjects in the Bible “we know.” We are so familiar with these things, we’ve stopped looking to see if what we’ve heard or what we believe is true. The Bible is pretty good when you read it! Be Not Drunk With Wine, Unless. . . The ebook is in PDF format, easily opened on your computer. It is 150 pages with 25 chapters. It is formatted in large font to be easily read on your computer or you can print it out. It can be yours by simply sending an email to me at jcweddle1 at juno.com Let me know you would like a copy and I’ll email one to you. The pastor in Ripon, CA who sold his own church unbeknownst to his congregation, has made a plea bargain. He faced up to nine years for selling the church and buying a BMW for his fiancee. After his plea, he should get 18 months. That’s worth it. I was just thinking, my church really could use a building. . .
A Southern Indiana church claims to have a door with an image of Jesus on it. They claim it looks like the image on the Shroud of Turin, which also doesn’t look like Jesus. The church’s pastor, Charlotte Pahls, said she sees the image as a sign. “I asked, ‘Why, Lord, a door?’ And he said, ‘I am the door. If anyone knock, I will come in and sup with them,’ ” Pahls told RTV6’s Ben Morriston. So, you’re telling me that Jesus said, “I am the door and if you knock on me, I will come in?” What? The door will come in the door? I don’t get it. Jesus should really read the Bible more often and get his parables straight. That just doesn’t make sense. Not to mention, if “anyone knocks” Jesus should say I will come in and sup with “him or her.” C’mon Jesus. I say we get more women pastors eh? Sorry, couldn’t resist. You can report me on the religious hatred bill if you so choose. Religious Hatred or just Plain Fun? British government types are still debating their religious hatred bill which makes it a hate crime to make a joke about a religion basically. A British comedian appeared before them and made a speech, which can be found here in its entirety. Here are a few quotes. It is absolutely right and reasonable that religions should be protected from threatening language, behaviour and written material but I support the amendment to retain the right to abuse and insult, because of the essentially irrational nature of religious beliefs. That is not to dismiss them: indeed, I’m a great believer that the most important and most sustaining things in life are essentially irrational. In my opinion, freedom of expression is being allowed to cause trouble, or create discomfort, or offence, as long as your words or behaviour are not threatening. Yet again, when it comes to recklessness, the Bill naively hopes for a distinction between attacks on beliefs and attacks on believers. Everyone needs to lighten up, that’s my view of the whole thing. Who cares if someone makes fun of you? That’s life, deal with it, maybe they’re right and maybe you should laugh too. Author jeffPosted on January 31, 2006 Categories Uncategorized2 Comments on Religious Hatred or just Plain Fun? Cargo Cults are weird religions that sprang up in the South Pacific during WWII. The February issue of Smithsonian carries a story on one of these cults originated by an American, John Frum. A group of teens requested to sing “The Lord is my Shepherd” during a church service. That sounds nice, good to see the youth are in church and that they like to sing a traditional song even. But they had ulterior motives. While singing the song, they stole several items from people near them. Then they took off. The reverend took off after them in his robes and ended up catching them and returning the stolen goods. Always beware anytime a kid volunteers anything in church.